It was only a matter of time — no pun intended — but I finally have the timeline for Overdraft online here at the site. This companion to the Glossary includes every date mentioned and many events alluded to thus far in the first two episodes of Overdraft: The Orion Offensive. As with the Glossary, I hope to update this regularly as more dates and events are revealed. Episode 3 of the Overdraft serial — titled "Underwater Holdings" — goes live on Tuesday, April 30 in the midafternoon, U.S. time. Click to subscribe! 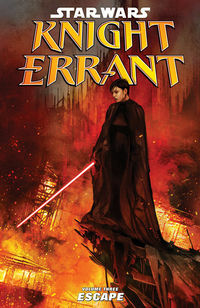 Also, I neglected to mention last week that Star Wars: Knight Errant Vol. 3 - Escape is now available at your local shop! Be sure to pick it up — and then check out the behind the scenes notes on the series here!